Published Nov 3, 2015 by Peachpit Press. Part of the Learn by Video series. 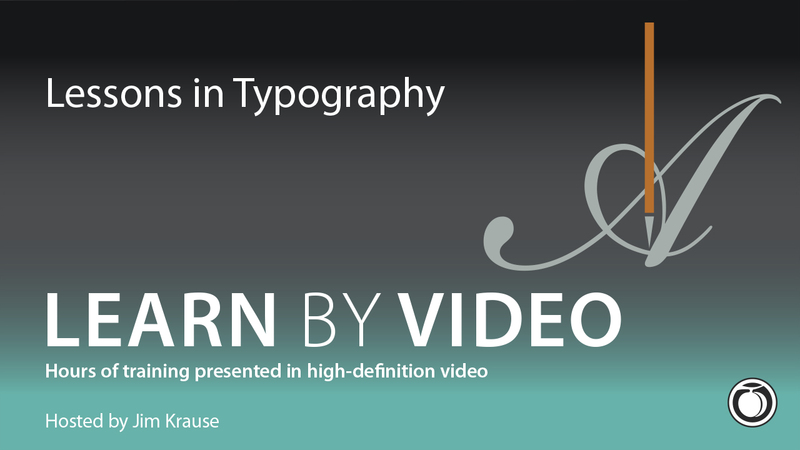 In just 2.5 hours of focused video tutorials, Advanced Lessons in Typography: Learn by Video helps graphic designers master the creation of a wide spectrum of brilliantly effective contemporary typographic solutions. Jim Krause covers creative techniques for all stages of typography design, from initial brainstorming and sketching to development and fine-tuning. He walks through projects including letterform customization, decorative character add-ons, word-graphic design, logotypes, custom typeface development, the creation of hand-drawn typographic components, and the aesthetic fine-tuning of text areas within layouts. Throughout, Krause demonstrates the use of appropriate tools, ranging from digital software and hardware to pencils, pens, brushes, ink, paint, sketch pads, and tracing paper. Krause's engaging and enlightening lessons draw on his immense experience instructing designers in more than two dozen books and video products. Whether you're a new or intermediate-level graphic designer, Advanced Lessons in Typography: Learn by Video will empower you to create unique, contemporary typographic solutions for logos, layouts, illustrations, and much more. The video is wrapped in a unique interface that allows you to jump to any topic and also bookmark individual sections for later review. Project files used in the lessons are included on the disc so you can practice what you’ve learned. At the end of every lesson, you can test your knowledge by taking interactive quizzes.